Project: Short Tracks is gearing up for the 2015 short track season. 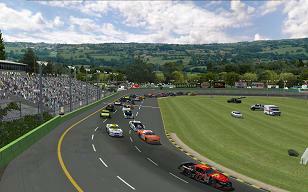 With that in mind, we are happy to announce our latest short track rebuild for NR2003, Autodrome Chaudiere. This quick ¼ mi. moderately banked oval in Vallée-Jonction, Quebec, Canada is one of the most popular stops on the ACT and PASS Super Late Model schedules and this PST replica of the track features many stunning graphic updates from the previously released version of the track. The first things you will notice are the familiar trademark lime green walls. (Just in time for St. Patrick's day... but we digress emoticon ). The newly installed grandstands (which were part of an extensive 2014 renovation at the facility) are also depicted along with totally refurbished A.I. that will provide a very satisfying racing experience. Autodrome Chaudiere is a stop on the schedules of some very prominent touring series including the NASCAR Canadian Tire Series along with multiple annual visits by the prestigious ACT and PASS Late Models. The track is known as the “Canadian Bristol” and packed houses are all but guaranteed every time the “Big Shows” visit. 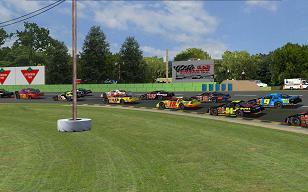 This NR2003 version features working pit stalls for 30 total cars (29 opponents) and two racing grooves. With 30 cars dicing for position, the action heats up quickly on this tight little bullring making passing very hard. While the preferred groove is on the bottom, you’ll probably find yourself hung out on the outside trying to fight your way back down as the field “freight trains” by on the inside. But don’t give up. Battle hard on the outside and make a “hole” to get back in line. PST prides themselves in their teamwork on their projects and this one is no exception. Please be sure to read about all of the contributions by the people involved in the CREDITS README file provided with the track. There are also some very important notes in there about the A.I. and how to get the best results when racing on the track in NR2003. NR2003 short track fans will revel in the joy of the constant side-by-side racing that this very popular Canadian racing venue delivers. Snug up those belts and get ready for the battle! A night version of the track is in production and will be released at a later date.